Mt. 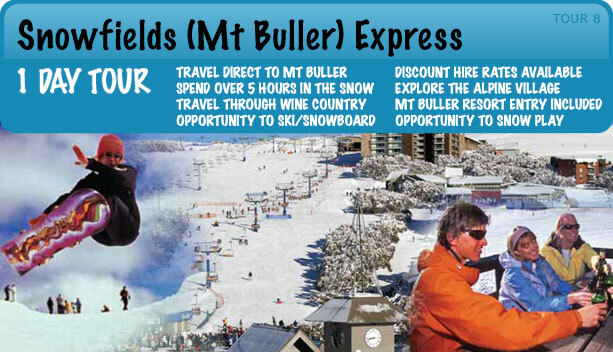 Buller is one of Australia's premier ski resorts. The ski fields are vast, covering all four sides of the mountain and caters for all levels of skiers, from gentle beginner slopes to spectacular double black diamond chute; plenty of options also exist for non-skiers. Sleep in and join our late departure for some sightseeing snow fun! The lift system is fast and numbers 25 lifts in total. Good snow reliability is supported by extensive snow making ensuring plenty of snow. Ski hire available en-route. Adverse weather conditions may cause cancellation or time changes. Mt. Buller - an exhilarating winter experience. This alpine wonderland is nestled high on the ski fields with quaint lodges, luxury hotels, cosy restaurants and cafes. Snowshoe walking, boardriding, skiing, tobogganing or simply enjoy the village atmosphere. Equipment and Clothing Hire is at passengers own expense or you can provide your own. This can be arranged whilst on tour at our first stop in Mansfield, feel free to ask your driver for assistance. +Please bring warm clothing. Hats, gloves and sturdy shoes required. We recommend that you hire snow jacket and boots.